It’s time for me to get ultra geeky. This is just the kind of food to get really excited about – and I have to admit, I waited awhile to make my visit to Ludo‘s temporary post at Breadbar and there was a lot of talk in the blogosphere preceding my visit. But I just had to see what all the hoopla was about. Upon actually eating Ludo Bites, though – I saw how it was easy to get excited about these plates. Well. I thought that such “beautiful” food must taste spectacular; I was also amazed that for the better part each plate really did. These bites are meant to surprise you. You will want more at the end of each plate but will be visually enticed directly into the next. The menu changes evolves daily. Ludo is constantly tinkering and perfecting if not overhauling these plates. 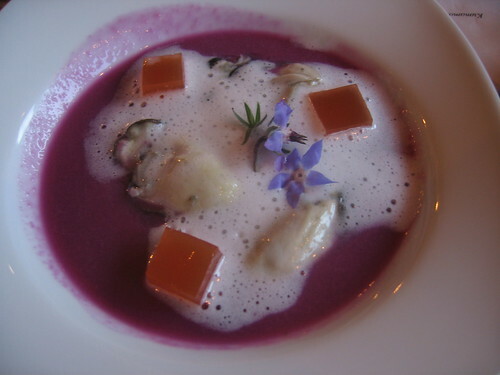 The Kumamoto Oysters came in a pool of red cabbage and three carefully-placed cubes of kimchi gelee. The foam, Sam and I were told, comes from the oysters themselves. How delightful, and outright resourceful, I thought. The oysters themselves were extra tender (fresh) and slurpable – if that were proper. But Ludo seems to love fun more than formality. The kimchi added a subtly fermented spice to the mixture. 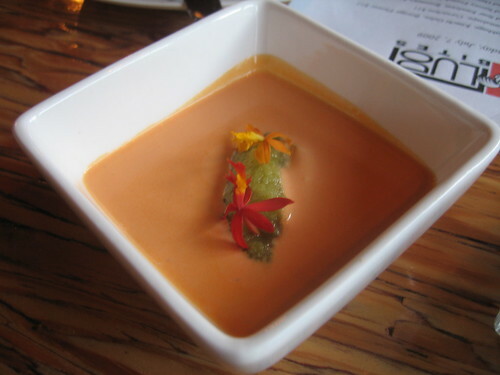 After enjoying the oysters and gelee, I couldn’t stop savoring the liquified red cabbage as its own soup. Just the same, I savored the chorizo soup before it. Standing in it was a dallop of gherkin – a tart, pickly little island in the center of a sea of salty, rich goodness. Okay, a mere pond. 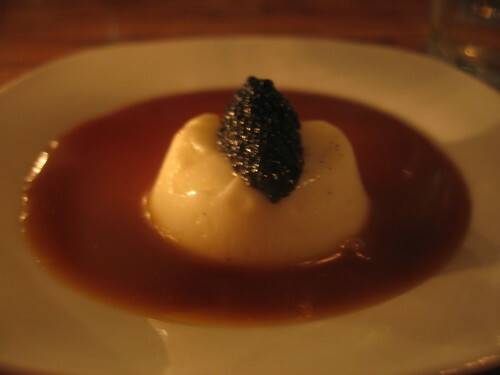 Though cantaloupes were not available this particular night, it is usually part of the plate and I’d be interested to try it with that sweet element in it. Really, though. I could have licked the soup out of the bowl. 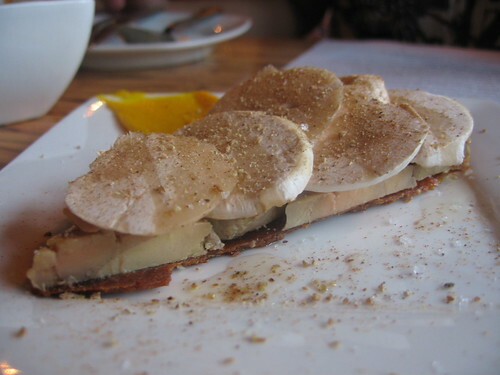 Now, that foie gras tart was incredibly interesting. 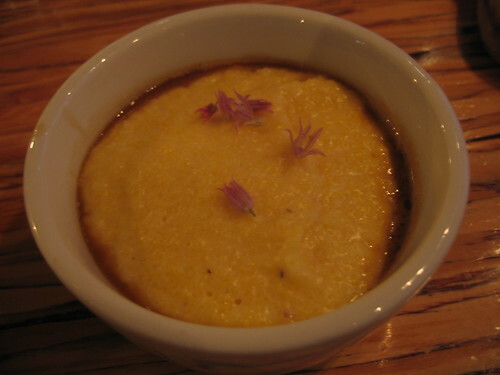 The creamy polenta, cantal cheese, oxtail beef and black truffle was rich and comforting. I’m a big fan of oxtail beef and the buttery quality it’s given in this dish was delicious. Also on tap for us was a super-interesting 65-degree poached egg that came with a carmelized savory french toast and smoked mornay sauce. And if you’ve ever eaten french toast with a poached egg for dinner before, please let me know. This wasn’t my favorite plate but I had to see what the fuss was about in regards to the french toast. 😉 And yes, every one of those 65 degrees is literal, so I’m told. 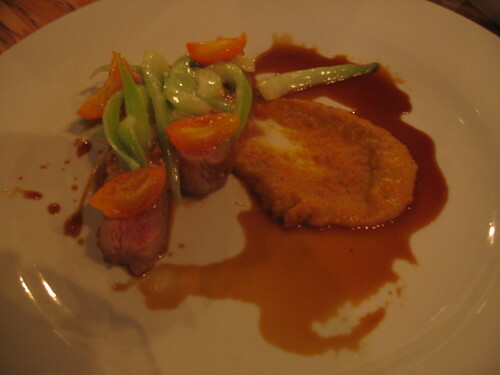 I had quite the time wrapping my head around the seared duck breast. It was paired with bok choy, mandarin kumquats but also carrot cake. Yes – my palate was telling me that I now like carrot cake with my duck? It made perfect sense, and I’m not talking “in theory” here.Â It’s funny because I thought theÂ baby bok choy in this plate was ironically expected…just because it’s Ludo. But the carrot cake was that wrench in this equation. Whoa. Anyway, I’m going to stop blabbin’ and let you gaze at the pictures. Ludo Bites really is a delightful experience – there’s plenty of reasons (one’s wallet is not one of them) – I hear about people going back again and again via Twitter. But for what these “bites” are, I think these prices reasonable – you just have to require a lot from your food. That’s not a bad thing. Ludo and his charming wife Krissy come with the dining experience and personally ensure that it is to your satisfaction. Not a bad way to occupy a temporary location. Unfortunately, Krissy wasn’t in-house when I went (though weÂ all ended up atÂ an unrelated dim sum dining experience later on, and we share a Wisconsin connection – yay!). But their foie gras cupcake might beÂ reason enoughÂ to drop in again, soon! This entry was posted in Food, Mid-City West and tagged Breadbar, Ludo Bites, Ludo Lefebvre, Ludobites. Bookmark the permalink.